"Nine Reasons to Make the Move"
Moving your computing infrastructure to the cloud has countless benefits for your business including increased productivity and mobilized workforce capability, Infrastructure-as-a-Service, and cloud backup and disaster recovery solutions. With Cloud Computing becoming more widely utilized, it is important for organizations to understand ways to maximize benefits and minimize risks of moving to the cloud. Scalability: Enables an organization to easily scale up or down as their business needs grow or change while migrating to the cloud. 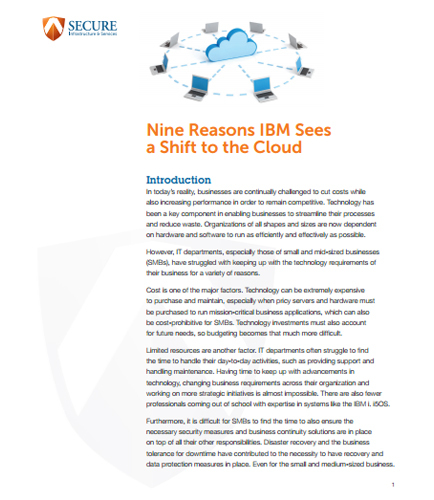 Download this informative whitepaper that comprehensively details the significant benefits of Cloud Computing and the reasons for switching your Infrastructure to the cloud based business model. Cloud based Laboratory Information Management System (LIMS) guarantees a limitless expansion for lab automation at an affordable price and thus, removes the existing bottlenecks for business growth in today's unpredictable economic times and with evolving cloud computing technologies, This white paper on “LIMS Implementation” is for those bio-banks, clinical research and food & beverage testing labs which are incognizant of the benefits of cloud computing for managing laboratory operations. It addresses some of the most crucial questions like: Why is cloud becoming the best choice for every lab, planning a LIMS implementation? How to scale and rapidly configure LIMS using cloud based SaaS? How can you successfully implement Laboratory information Management System (LIMS)? What is the best effective method of mitigating risks in a well-designed LIMS system? What are the most common LIMS implementation mistakes and how to avoid them?